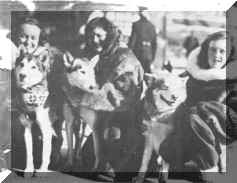 In 1949 Louise Lombard was the only woman entered in the 90-mile Ottawa Dog Sled Derby. She raced in competition with her husband. 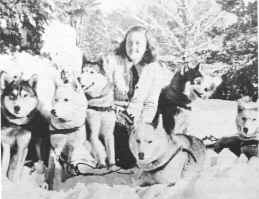 At that time she was driving a team of six Malamutes led by a Siberian Husky named “Wolf” who has made a name for himself as one of the Army dogs sent over to Europe to be used in the Battle of the Bulge removing the wounded from the battle ground. Mrs. E.P. Ricker, now Mrs. Nansen, drove dogs in 1928. She placed 2nd in the 4th Annual Sled Dog Derby in Lake Placid in 1931. 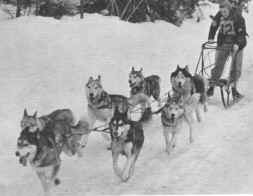 Her daughter, Bunty Dunlap also became a good sled dog driver. Lorna Demidoff of Monadnock Kennels lays claim to being the only woman driver to win a New England Sled Dog Race in a period of 31 years. Short Seeley of Chinook Kennels in addition to racing a fine team, participated in the OLYMPICS in the 1930’s at Lake Placid – being the only woman to have that distinction. At Anchorage, the Women’s Champion Rendezvous Race was started in 1953. Joyce Wells drove a team of Targhee Hounds to victory in that first race. The next year Natalie Norris won the race driving a team of registered Siberian Huskies. 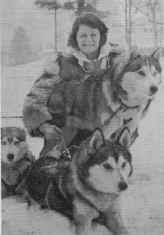 Millie Turner of Cold River Kennels drove a Class A team in the New England Sled Dog Club all through the 1930’s and the early 40’s to place well in all races including some of the “tough ones” in Canada. Jean Bryar won the North American Woman’s Championship at Fairbanks to become the first woman from the lower 49 states to achieve this. She also competed in many of the grueling Canadian races as well as Laconia, often placing in the winner’s circle. . . .